Juice Plus+ is a branded line of dietary supplements containing concentrated fruit and vegetable juice extracts fortified with added vitamins and nutrients. It is produced by Natural Alternatives International of San Marcos, California, for National Safety Associates (NSA; Collierville, Tennessee). Introduced in 1993, the supplements are distributed by NSA via multi-level marketing. Studies of Juice Plus' effects have generated conflicting and controversial results. Although Juice Plus claims its products' efficacy is backed by research, critics have argued that there is no scientific proof that Juice Plus offers significant health benefits and that deceptive claims are used in the product's marketing information. Many marketing claims made about Juice Plus products are false or misleading. National Safety Associates was founded in 1970 by Jay Martin, a schoolteacher-turned-entrepreneur, who continued as CEO as of 2012. NSA initially sold home fire-protection equipment via door-to-door salespeople. In the late 1970s, they expanded into water filtration products. In 1986, they began using multi-level marketing, then expanding their product line to air filters and educational games for pre-schoolers. In 1991, it was claimed that their sales structure constituted a ponzi scheme. NSA had some legal troubles in 1993, as the United States Attorney General's office followed up on complaints that the company was deceptively requiring new distributors to make large upfront purchases of air and water filters. Each of the 32,000 distributors in Florida purchased an average of $7,000 worth of water filters, and many of these distributors were unable to sell all of them. The company's business in the United States decreased that year, requiring the layoff of dozens of employees. The company has expanded its business outside the United States, and according to NSA, was selling products in 33 countries as of the year 2000. NSA stopped manufacturing and marketing its water filter product line in 2007. Juice Plus was NSA's first nutritional product, launched in 1993. The primary products in the Juice Plus line are "Orchard Blend" (a fruit juice powder-based supplement) and "Garden Blend" (vegetable juice powder-based) capsules, which are sold together in a four-month pack at a cost of approximately $167 USD (2009). Other supplement products available in the Juice Plus line are (in 2011) Vineyard Blend (grape/berry juice powder-based) capsules, Juice Plus Complete (meal replacement powder), Juice Plus Chewables (Orchard and Garden Blends), and Juice Plus Chewables (Vineyard Blend). Discontinued products include Juice Plus Gummies, Juice Plus Thins (wafers), chewable tablets, and a vitamin formulation for dogs and cats. 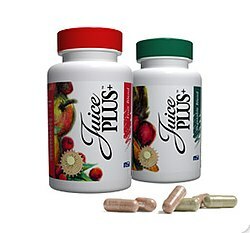 The main ingredients in Juice Plus Orchard Blend and Garden Blend capsules (vegetable and fruit juices) are reduced to powder through a proprietary process by an unrelated supplier, and then blended and encapsulated by NAI, who produce the finished product. Juice Plus capsules are “enriched with pure β-carotene, ascorbic acid, vitamin E, and folic acid”. According to the manufacturer these are added to restore the levels of micronutrients lost during processing and to ensure uniformity.” Two NAI-sponsored studies  mention that the fruit and vegetable powders in Juice Plus include standardized levels of natural β-carotene derived from Dunaliella salina and soy-derived d-α-tocopherol (vitamin E), which are supplied by the Henkel Corporation (now doing business as Cognis Corporation), and ascorbic acid derived from acerola cherry, which is supplied by Schweizerhall Pharma. Juice Plus+ Garden Blend was tested by ConsumerLab.com in their Multivitamin and Multimineral Supplements Review of 38 of the leading multivitamin/multimineral products sold in the U.S. and Canada. Testing included amounts of selected index elements, their ability to disintegrate in solution per United States Pharmacopeia guidelines, lead contamination threshold set in California Proposition 65, and meeting U.S. Food and Drug Administration (FDA) labeling requirements. Garden Blend failed ConsumerLab's test as it contained only 76.4% of its claimed calcium, which was noted was low to start (labeled as just 4% of the Daily Value per serving.) On 23 June 2011, ConsumerLab was informed of misinformation circulated by a Juice Plus distributor incorrectly stating the variation was due to the analytical method used. ConsumerLab responded that their analytic method used was ICP-MS (Inductively Coupled Plasma Mass Spectrometry), a "highly precise and sensitive method of testing calcium". ConsumerLab also noted that the calcium deficiency in Juice Plus was confirmed with this method in two independent laboratories prior to publication of their Review. Of the published peer-reviewed studies on Juice Plus products, most were funded and/or authored by the manufacturer, Natural Alternatives International (NAI); or the main distributor, NSA. ; and two were funded by individual Juice Plus distributors. Concerns have been raised that the nutrients in Juice Plus+ capsules may not be bioavailable or effectively absorbed by the human body, and that some of the nutrients claimed to be in the products may not be present in significant amounts. Studies on nutrient absorption showed that subjects taking Juice Plus had elevated blood levels of folate and β-carotene, but the effects on blood levels of vitamin E and vitamin C were inconsistent. Some studies have shown significant increases in vitamin E and C levels, while other studies have shown much weaker effects on vitamin E and C levels, and that the levels of vitamin E and vitamin C are not significantly increased. Juice Plus was found to increase blood lycopene levels in several studies, while other studies have indicated that Juice Plus does not raise blood levels of lycopene or other phytochemicals in fresh fruits and vegetables such as lutein, zeaxanthin, and β-cryptoxanthin. Concerns have also been raised about the accuracy of product labeling. Three studies which included chemical analyses of Juice Plus have indicated nutrient amounts that differ from the amounts listed on the product labels. According to Consumer Reports, in 2005, National Safety Associates used advertising featuring Dr. William Sears (a distributor of Juice Plus products), which implied that Juice Plus Gummies were low in sugar and a nutritional alternative to fruits and vegetables. This claim resulted in consumer complaints to the Better Business Bureau's National Advertising Division (NAD). The BBB issued a complaint that NSA's claims were misleading, and as a result, NSA promised to modify its ads and stop calling Gummies “the next best thing to fruits and vegetables”. The Juice Plus homepage continues to advertise Juice Plus as “the next best thing to fruits and vegetables”; the Gummies product has since been discontinued; the product "Chewables" has been introduced. Two nutrition specialists commented that “the promotional literature for Juice Plus, billed as a whole food concentrate, is a carefully worded blend of incorrect information, misleading health claims, and nonscientific jargon” and concluded that “Juice Plus probably won't harm you, but can hurt your pocketbook." Others have provided similar skeptical assessments of Juice Plus+. NSA claims that Juice Plus is an effective antioxidant, and quotes a study that showed a 75% reduction in lipid peroxidation (an oxidative stress marker) in subjects that took Juice Plus for 7 to 28 days. This report was criticized as “a particularly poor study” by nutritionist Rosemary Stanton in the Australian journal, The Skeptic. Other studies have also reported reductions in lipid peroxidation and DNA oxidation. These three studies were not blinded or placebo-controlled, included few participants (in one case no more than 15), and did not include monitoring or control of the participants' food intake. Other studies conducted under more rigorous conditions (randomized, double-blind, placebo-controlled, longer in duration and with more subjects), found no significant reductions in lipid peroxidation, DNA oxidation, or other markers of oxidative stress. One study, which measured in vitro antioxidant activity, found that 1 g of Juice Plus Orchard Blend/Garden Blend powder (500 mg of each combined) had the corresponding antioxidant capacity to approximately 10 g (fresh weight) of fruit or vegetable, amounting to 30 g (roughly one-third of a serving) per four capsules. Tests of antioxidant activity of polyphenols (such as those in Juice Plus capsules) in vitro likely show higher results than the negligible antioxidant activity in vivo following oral ingestion and digestion. One placebo-controlled study conducted in 2002 found that Juice Plus Gummie candies did not significantly improve the antioxidant status of children, as indicated by negative results from 6 different antioxidant tests. The authors explained this by saying it was possible that the supplement did not contain enough of the proper antioxidants to make a significant difference or that the antioxidants extracted in the fruit/vegetable extract were not bioavailable. The study was originally sponsored by NSA, but because the results were disappointing, NSA officials elected to remove the company’s name from the published article. Jim Sears, a pediatrician and Juice Plus distributor/spokesperson who co-hosts the syndicated daytime television talk show The Doctors, claimed on a February 27, 2009 episode of the program that Juice Plus "helps fight cancer". In October 2009, Dr. Barrie R. Cassileth, Chair and Chief of Integrative Medicine at Memorial Sloan-Kettering Cancer Center, cautioned that while Juice Plus is being "aggressively promoted to cancer patients based on claims of antioxidant effects", the supplement should not be taken by patients because it can interfere with chemotherapy, nor should it be considered a substitute for fruits and vegetables. Several studies have examined the effects of Juice Plus capsules on biochemical parameters associated with cardiovascular function, again with conflicting results. In October 2009, Dr. Barrie R. Cassileth, Chair and Chief of Integrative Medicine at Memorial Sloan-Kettering Cancer Center, noted that the results of Juice Plus studies on plasma homocysteine levels were not reproducible, and that studies on cardiovascular effects, such as blood pressure and cholesterol, were inconclusive. The effects of Juice Plus on blood levels of homocysteine have been reported in five studies, all conducted in subjects with normal homocysteine levels (15 μmol/L). An initial study, which was not double-blind nor placebo-controlled, reported a 37% decrease in homocysteine levels in subjects taking Juice Plus. More rigorous studies, including three that were randomized, double-blind, placebo-controlled trials, found that homocysteine levels were not reduced or were reduced to a much lesser extent than originally reported. Two randomized, double-blind placebo-controlled studies have examined the effect of Juice Plus on serum cholesterol and LDL levels. One study found that Juice Plus had no significant effects; the other found slight decreases in cholesterol (6%) and LDL (9%) in subjects that took Orchard/Garden Blend, but no reductions among subjects who took Juice Plus Vineyard blend in addition. A study reported that a combined regimen of Juice Plus Orchard Blend and Garden Blend significantly decreased the impairment of brachial artery vasoactivity caused by a high-fat meal in healthy subjects. The addition of the Vineyard Blend product to this regimen had no additional effect on brachial artery vasoactivity and led to an increase in total lipoprotein and LDL as compared with Orchard Blend/Garden Blend alone. This study also found that Juice Plus had no effect on blood pressure. In a randomized placebo-controlled, crossover study in adults with metabolic syndrome, 8-week supplementation with Juice Plus had no significant effect on vascular endothelial function, serum insulin, blood glucose, body weight, total cholesterol, or LDL cholesterol. The study, initiated in 2004 and published in 2011, was led by Juice Plus spokesman David L. Katz who received a $200,000 research grant from NSA. A non-randomized, non-blinded, non-controlled study in elderly cigarette smokers and non-smokers examined the effects of Juice Plus Orchard Blend and Garden Blend on 9 immunologic parameters, including stimulated T-cell cytokine production (IL-2, IL-6, TNF-α and IFN-γ) and the activity of various immune cells (peripheral blood monocytes, natural killer [NK] cells, T-helper cells, and cytotoxic T cells). Juice Plus significantly increased peripheral blood monocyte proliferation and NK cell cytotoxicity in non-smokers but not in smokers, and increased in vitro IL-2 production by stimulated monocytes in both smokers and non-smokers. Juice Plus had no significant effect on cell counts (NK cells, T-helper cells, or cytotoxic T cells) or on the levels of IL-6, TNF-α, or IFN-γ in either smokers or non-smokers. Memorial Sloan-Kettering Cancer Center noted several faults with this study including that it lacked placebo controls and was not blinded, that the results do not necessarily correlate with an overall increase in immunity, and that it would have been more informative had clinical parameters been measured, such as whether fewer patients became sick. A double-blind, randomized, placebo-controlled study examined the effect of Juice Plus Orchard Blend and Garden Blend on T cell counts, lymphocyte cytokine production, Epstein-Barr virus (EBV) antibody titers, and the incidence of illness in healthy subjects. The percentage of circulating γδ-CD3+ T cells and αβ-CD3+ T cells did not change significantly in subjects who took Juice Plus; however, at the end of the supplementation period, subjects taking the supplement had a significantly higher percentage of γδ-CD3+ T cells (7.2%) as compared with placebo (5.4%). IFN-γ produced by stimulated lymphocytes in vitro was reduced in the Juice Plus (68%) and placebo groups (41%), but the reduction was statistically significant only in the Juice Plus group. The levels of other cytokines (IL-4, IL-6, TGF-β) were unchanged and Juice Plus had no significant effect on the incidence and symptoms of illness or on EBV antibody titers. A double-blind, randomized, placebo-controlled 28-week study examined the effect of Juice Plus (two capsules each of Orchard Blend, Garden Blend, and Vineyard blend per day) on cytokine (i.e., IL-6 and TNF-α) levels, and on the incidence of illness. Subjects who took Juice Plus had lower TNF-α levels than the placebo group at later time points in the study (week 16 and 28) but overall the effect was not statistically significant. Juice Plus was found to have no significant effect on IL-6 levels or on the incidence of illness during the course of the study. In one preliminary human study, consumption of Juice Plus was associated with a 20% reduction in the number of days of severe to moderate common cold symptoms, while the number of days with any cold symptoms was unchanged. The study was funded by NSA, owners of Juice Plus and the sponsor participated in the design of the study. Adverse effects of Juice Plus have been mentioned in three studies, No monitoring of adverse effects was reported in other published Juice Plus studies. The first of these studies (in 2000) reported adverse effects (upper-respiratory tract, urinary, and musculoskeletal) in roughly a third of the participants who took the products for 7 days; these events resolved spontaneously and were deemed unlikely to have derived from use of Juice Plus. Memorial Sloan-Kettering Cancer Center noted that in the second of these studies, some subjects who took Orchard Blend and Garden Blend developed a hive-like rash. In the third study, from 2007, some subjects withdrew due to gastrointestinal distress, possibly caused by the Juice Plus regimen (a combination of Orchard Blend, Garden Blend, and Vineyard Blend). In addition a medical case report was published in which Juice Plus was identified as the probable cause of liver toxicity (hepatic inflammation) in a 51-year-old female patient with endometrial cancer. The liver injury was reversed upon discontinuation of Juice Plus. In a critique of Juice Plus, consumer health advocate and alternative medicine critic Stephen Barrett of MLM Watch remarked upon the previous association between two authors of a 1996 Juice Plus research study  and United Sciences of America, Inc. (USAI), a multilevel marketing company that sold vitamin supplements with illegal claims that they could prevent many diseases. In 1986, lead author John A. Wise, who later co-authored several other Juice Plus research studies, was USAI's Executive Vice-President of Research and Development; and second author Robert J. Morin was a scientific advisor who helped design the products. State and federal enforcement actions drove USAI out of business in 1987. Wise became a consultant to Natural Alternatives International (NAI) in 1987 and a company executive (Vice-President of Research and Development) in 1992. Barrett noted that Wise was also an NAI shareholder and that production of Juice Plus for National Safety Associates (NSA) was responsible for 16% of NAIs sales in 1999. NSAs Juice Plus website cites various research articles in support of the company's marketing claims about the biological effects of Juice Plus, maintaining that these “studies were conducted by independent researchers” at various universities. Several of the studies were co-authored by Wise  and Morin. University of California Berkeley Wellness Letter and MLMWatch also commented on the unreliability of Juice Plus testimonials provided by former professional athlete O.J. Simpson. Simpson, known commonly as "O.J." and "The Juice", signed a multi-year six-figure contract with NSA in January 1994 and became an official celebrity endorser of Juice Plus. In March 1994, Simpson was videotaped telling 4,000 Juice Plus distributors at a sales meeting that the product had cured his arthritis, improved his golf game, and freed him from using anti-arthritic drugs. However, regarding the murder of his ex-wife Nicole Brown Simpson and her friend, Ronald Goldman, for which Simpson was tried and acquitted, Simpson claimed in his defence that he was too incapacitated by arthritis to have committed the murders and had continued to take the anti-inflammatory drug sulfasalazine. As a result of the controversy surrounding Simpson, NSA cancelled his endorsement contract and stopped using the Simpson videotape to promote Juice Plus. The Juice Plus Children's Research Foundation (JPCRF), founded in 1997, is a non-profit medical research organization (NTEE code H99) whose stated goal is to initiate and/or support programs that advance the principle that improved nutrition leads to healthier lifestyle and overall better health in children. The foundation is chaired by executives of National Safety Associates and operates from the company's head office in Collierville, Tennessee. In fiscal year 2007, the majority of funds donated to the foundation were disbursed to Volunteers of America (a faith-based social welfare organization) and to the Boys & Girls Clubs of Memphis. The Foundation's website shows results of an ongoing customer survey (The Juice Plus Children's Health Study) which suggests a link between Juice Plus consumption and a general improvement in diet and lifestyle habits. The University of California Berkeley Wellness Letter and Stephen Barrett of MLM Watch questioned the survey's scientific value, and claimed that the Foundation is being used mainly as a marketing gimmick to get families to buy Juice Plus products. Barrett's organization Quackwatch includes the JPCRF among its list of "Questionable 'Research' Entities". ^ a b c d e f g h i Barrett, Stephen. "Juice Plus: A Critical Look". MLM Watch. Retrieved 2009-08-21. ^ a b "How Product Testimonials Bend The Rules". Consumer Reports. January 2006. Archived from the original on 2006-07-21. Retrieved 2011-08-12. ^ a b c d "Juice Up and Dried Out". University of California Berkeley Wellness Letter. Archived from the original (PDF) on October 13, 2005. Retrieved December 15, 2009. ^ a b c d Maruyama, Fudeko T.; Mary P. Clarke (January 1995). "Juice Plus, Food or Supplement". Kansas State University, Dept. of Human Nutrition. Archived from the original on 2006-02-06. Retrieved 2007-07-22. ^ Walsh, James (2009). You Can't Cheat an Honest Man: How Ponzi Schemes and Pyramid Frauds Work and Why They're More Common Than Ever. Silver Lake Publishing. p. 186–7. ISBN 9781563431692. ^ "Marketing—education is NSA's new game". The Commercial Appeal. June 30, 1991. ^ Grady, Bill; Goozner, Merrill; O`Brien, John (19 February 1991). "Case Could Drain A Marketing Pool". Chicago Tribune. Retrieved 20 January 2018. ^ Campbell, Laurel (August 31, 1993). "NSA returns to marketing focus, trims Memphis staff". The Commercial Appeal. Memphis. ^ "Business notes". Jefferson City News-Tribune. November 26, 2000. ^ a b "Other Juice Plus+® Products". juiceplus.com. Retrieved 2011-08-08. ^ "Other Juice Plus+® Products". juiceplus.com. Archived from the original on 2005-11-30. Retrieved 2011-06-01. ^ "Juice Plus+® for Dogs/Juice Plus+® for Cats" (PDF). nsaonline.com. Archived from the original (PDF) on 2012-03-24. Retrieved 2011-06-01. ^ "NSA International, Inc. Form 10-K (7/30/1996)". sec.edgar-online.com. Archived from the original on 2008-02-13. Retrieved 2007-09-15. ^ a b c Watzl B, Bub A (November 2003). "Fruit and vegetable concentrate or vitamin supplement?". The Journal of Nutrition. 133 (11): 3725, author reply 3726. doi:10.1093/jn/133.11.3725. PMID 14608104. ^ Samman, S. (1 November 2003). "Letter to the Editor: Reply to Watzl and Bub" (PDF). J Nutr. 133 (7): 3726. ^ a b c d e f g h i Wise JA, Morin RJ, Sanderson R, Blum K (1996). "Changes in plasma carotenoid, alpha-tocopherol, and lipid peroxide levels in response to supplementation with concentrated fruit and vegetable extracts: A pilot study". Curr Ther Res. 57 (6): 445–461. doi:10.1016/S0011-393X(96)80053-1. ^ a b c d e f g Leeds AR, et al. (2000). "Availability of micronutrients from dried, encapsulated fruit and vegetable preparations: a study in healthy volunteers". J Hum Nutr Diet. 13: 21–27. doi:10.1046/j.1365-277x.2000.00206.x. ^ "Welcome to Cognis". Cognis. Archived from the original on 20 August 2007. Retrieved 20 November 2014. ^ "Yahoo Finance: Cognis Corporation Company Profile". biz.yahoo.com. Retrieved 2007-09-16. ^ "Schweizerhall Pharma homepage". Schweizerhall Pharma. Archived from the original on 11 June 2008. Retrieved 20 November 2014. ^ "ConsumerLab Multivitamin and Multimineral Supplements Review - Testing Method". 15 June 2011. Retrieved 18 August 2011. ^ "NSA Inc. Company Profile". biz.yahoo.com. Retrieved 2007-09-15. ^ Green, Frank (February 22, 1995). "O.J. plug is a plus. The prosecution mentions Juice Plus, and sales are up". San Diego Union-Tribune. ^ Riggs, Rod (June 19, 1993). "Olympics may mean gold for San Marcos firm". San Diego Union-Tribune. ^ a b "Juice Plus homepage". National Safety Associates. Retrieved 2011-06-01. ^ a b c d e f "Juice Plus—and minus" (PDF). University of California Berkeley Wellness Letter. Archived from the original (PDF) on 2007-09-28. Retrieved 2006-10-15. ^ a b Goodwin, Kathy. "Dietary supplements: facts about Juice Plus". The Diet Channel. Retrieved 2006-10-15. ^ a b c d Stanton R (2000). "Nutrition: who can you believe?" (PDF). The Skeptic. 20 (4): 23–7. Archived from the original (PDF) on 2012-05-09. ^ Schardt, David (December 2007). "Lost in translation: why real fruit and vegetables beat juices, powder, and purees" (PDF). Nutrition Action Healthletter. Center for Science in the Public Interest (CSPI). Archived from the original (PDF) on 2008-10-23. Retrieved 2008-03-11. ^ "The minuses of Juice Plus". Tufts University Health & Nutrition Letter. 24 (6): S1, 4. 2006. ISSN 1526-0143. ^ a b Schontz, Lori (January 15, 2007). "Nutritional shortcut bypasses benefits of eating the real thing". St. Louis Post-Dispatch. ^ a b c d e f g Plotnick GD, Corretti MC, Vogel RA, Hesslink R, Wise JA (May 2003). "Effect of supplemental phytonutrients on impairment of the flow-mediated brachial artery vasoactivity after a single high-fat meal". Journal of the American College of Cardiology. 41 (10): 1744–1749. doi:10.1016/S0735-1097(03)00302-4. PMID 12767658. ^ a b c d e f g Kiefer I, Prock P, Lawrence C, et al. (June 2004). "Supplementation with mixed fruit and vegetable juice concentrates increased serum antioxidants and folate in healthy adults". Journal of the American College of Nutrition. 23 (3): 205–11. doi:10.1080/07315724.2004.10719362. PMID 15190044. Archived from the original on 2013-04-15. ^ a b c d e f g h i j k Smith MJ, Inserra PF, Watson RR, Wise JA, O'Neill KL (1999). "Supplementation with fruit and vegetable extracts may decrease DNA damage in the peripheral lymphocytes of an elderly population". Nutr Res. 19 (10): 1507–1518. doi:10.1016/S0271-5317(99)00107-4. ^ a b c d e f g Inserra PF, Jiang S, Solkoff D, Lee J, Zhang Z, Xu M, Hesslink R, Wise J, Watson RR (1999). "Immune function in elderly smokers and nonsmokers improves during supplementation with fruit and vegetable extracts". Integr Med. 2 (1): 3–10. doi:10.1016/S1096-2190(99)00010-4. ^ a b c d e f g h i j k l Samman S, Sivarajah G, Man JC, Ahmad ZI, Petocz P, Caterson ID (July 2003). "A mixed fruit and vegetable concentrate increases plasma antioxidant vitamins and folate and lowers plasma homocysteine in men". The Journal of Nutrition. 133 (7): 2188–93. doi:10.1093/jn/133.7.2188. PMID 12840177. ^ a b c d e Bloomer RJ, Goldfarb AH, McKenzie MJ (June 2006). "Oxidative stress response to aerobic exercise: comparison of antioxidant supplements". Medicine and Science in Sports and Exercise. 38 (6): 1098–1105. doi:10.1249/01.mss.0000222839.51144.3e. PMID 16775552. ^ a b c d e f g Nantz MP, Rowe CA, Nieves C, Percival SS (October 2006). "Immunity and antioxidant capacity in humans is enhanced by consumption of a dried, encapsulated fruit and vegetable juice concentrate". The Journal of Nutrition. 136 (10): 2606–10. doi:10.1093/jn/136.10.2606. PMID 16988134. ^ a b c d e f g h i j k l m Kawashima A, Madarame T, Koike H, Komatsu Y, Wise JA (2007). "Four week supplementation with mixed fruit and vegetable juice concentrates increased protective serum antioxidants and folate and decreased plasma homocysteine in Japanese subjects". Asia Pacific Journal of Clinical Nutrition. 16 (3): 411–21. PMID 17704021. ^ a b c Lamprecht M, Oettl K, Schwaberger G, Hofmann P, Greilberger JF (December 2007). "Several indicators of oxidative stress, immunity, and illness improved in trained men consuming an encapsulated juice powder concentrate for 28 weeks". The Journal of Nutrition. 137 (12): 2737–41. doi:10.1093/jn/137.12.2737. PMID 18029492. ^ a b Stewart, R.J.; et al. (November 2002). "Antioxidant status of young children: Response to an antioxidant supplement". J Am Diet Assoc. 102 (11): 1652–1657. doi:10.1016/S0002-8223(02)90352-4. ^ a b c Bamonti F, et al. (2006). "Increased free malondialdehyde concentrations in smokers normalise with a mixed fruit and vegetable juice concentrate: a pilot study". Clin Chem Lab Med. 44 (4): 391–395. doi:10.1515/CCLM.2006.084. PMID 16599830. ^ a b Panunzio MF (2003). "Supplementation with fruit and vegetable concentrate decreases plasma homocysteine levels in a dietary controlled trial". Nutr Res. 23 (9): 1221–1228. doi:10.1016/S0271-5317(03)00133-7. ^ "EN Squeezes the Raw Truth Out of Juice Plus Claims". Environmental Nutrition. March 2002. ^ "CSPI targets juice capsules". The Tan Sheet. 15 (51). FDC Reports. December 17, 2007. ^ "How Product Testimonials Bend The Rules". Consumer Reports. Archived from the original on 2006-07-21. Retrieved 2006-10-15. ^ a b Stanton, Rosemary. "Australian Institute of Health and Welfare". Australian Institute of Health and Welfare. Retrieved 20 July 2014. ^ "Complaint 19-0607 Juice Plus (10/04/2007)". Complaints Resolution Panel; Therapeutic Goods Advertising Code Council. Archived from the original on 2009-02-04. Retrieved 2008-07-09. ^ Chambers SJ; et al. (1996). "Evaluation of the antioxidant properties of a methanolic extract from 'Juice Plus fruit' and 'Juice Plus vegetable' (dietary supplements)". Food Chem. 57 (2): 271–274. doi:10.1016/0308-8146(95)00223-5. ^ Williams RJ, Spencer JP, Rice-Evans C (April 2004). "Flavonoids: antioxidants or signalling molecules?". Free Radical Biology & Medicine. 36 (7): 838–849. doi:10.1016/j.freeradbiomed.2004.01.001. PMID 15019969. ^ "The Doctors episode synopsis". February 27, 2009. Archived from the original on March 30, 2009. Retrieved October 30, 2009. ^ a b Cassileth, Barrie (2009). "Juice Plus". Oncology. 23 (11): 987. PMID 19947351. ^ De Luca G, Suryapranata H, Gregorio G, Lange H, Chiariello M (November 2005). "Homocysteine and its effects on in-stent restenosis". Circulation. 112 (19): e307–11. doi:10.1161/CIRCULATIONAHA.105.573923 (inactive 2018-09-21). PMID 16275872. ^ Freedman JE (May 2003). "High-fat diets and cardiovascular disease: are nutritional supplements useful?". Journal of the American College of Cardiology. 41 (10): 1750–1752. doi:10.1016/S0735-1097(03)00303-6. PMID 12767659. ^ Ali, A; Yazaki Y; Njike VY; Ma Y; Katz DL (2011). "Effect of fruit and vegetable concentrates on endothelial function in metabolic syndrome: A randomized controlled trial". Nutrition Journal. 10 (72): 72. doi:10.1186/1475-2891-10-72. PMC 3135513. PMID 21714890. ^ "Juice Plus+ preventive health advisor, Dr. David Katz, named top influencer in health and fitness". juiceplus.com. January 22, 2014. Retrieved August 1, 2017. ^ "David Katz partners with Juice Plus to teach kids nutrition and combat obesity". May 8, 2013. Retrieved August 1, 2017. ^ "Effect of Fruit and Vegetable Concentrates on Endothelial Function in Persons With Metabolic Syndrome (ClinicalTrials.gov ID: NCT01224743)". ClinicalTrials.gov. Retrieved August 1, 2017. ^ a b Houston MC, Cooil B, Olafsson BJ, Raggi P (2007). "Juice Powder Concentrate and Systemic Blood Pressure, Progression of Coronary Artery Calcium and Antioxidant Status in Hypertensive Subjects: A Pilot Study". ECAM. 4 (4): 455–462. doi:10.1093/ecam/nel108. PMC 2176151. PMID 18227913. Archived from the original (PDF) on 2007-03-13. ^ Naing A, Aaron J, Kurzrock R (2010). "Juice Plus or Toxicity Plus" (PDF). Am J Med. 123 (1): e1–e2. doi:10.1016/j.amjmed.2009.06.025. PMID 20102976. ^ a b c Barrett, Stephen. "The Rise and Fall of United Sciences of America". MLM Watch. Retrieved 2007-07-27. ^ a b Stare, F.J.; . (1986). "Marketing a nutritional "revolutionary breakthrough". Trading on names". N Engl J Med. 315 (15): 971–973. doi:10.1056/NEJM198610093151518. PMID 3762604. ^ a b c Young, E.A. ; Schenker, S.; Weser, E. (1987). "United Sciences of America, Incorporated: an "optimal" diet?". Ann Intern Med. 107 (1): 101–3. doi:10.7326/0003-4819-107-1-101. PMID 3592422. ^ a b Renner, J.H. (1986). "Science or scam?". N Engl J Med. 315 (15): 971. doi:10.1056/NEJM198610093151517. PMID 3762603. ^ a b Holden, C. (1986). "Scientists get flak over marketing plan". Science. 234 (4780): 1063–1064. Bibcode:1986Sci...234.1063H. doi:10.1126/science.3775374. PMID 3775374. ^ a b c "USA: The strange rise and fall of one MLM". Money (June 1). 1987. ^ "Results of Juice Plus Clinical Research". National Safety Associates. Archived from the original on 2011-07-13. Retrieved 2011-06-01. ^ a b Wise JA, Kaats GR, Preuss HG, Morin RJ (2009). "β-Carotene and α-tocopherol in healthy overweight adults; depletion kinetics are correlated with adiposity". Int J Food Sci Nutr. 60 (s3): 65–75. doi:10.1080/09637480902852553. PMID 19391032. ^ Friedman, Roger (November 21, 2006). "If O.J. Simpson did it, this is how". Fox News. Retrieved 2007-09-15. ^ Deutsch, Linda (July 19, 1995). "Simpson exercise video shown in murder trial. Defendant jokes about punching wives". Fort Worth Star-Telegram. ^ "Simpson said capsules killed his arthritis pain". San Jose Mercury News. February 17, 1995. pp. 15A. Retrieved 2007-09-15. ^ Morrison, Patt (September 14, 2007). "Book review: After 'yuck,' the farce of O.J. Simpson's book -- 'If I Did It' reads like a self-absorbed counseling session". LA Times. Retrieved 2011-06-25. ^ Friedman, Roger (June 3, 2004). "O.J. defense doctor: 'some guilty people are set free'". Fox News. Retrieved 2007-09-15. ^ "Partial transcript of Simpson civil trial (Regina D. Chavez official reporter)". CNN. October 24, 1995. Archived from the original on February 8, 2007. Retrieved 2007-09-15. ^ "Simpson civil trial transcript (Regina D. Chavez official reporter)". CNN. January 6, 1997. Archived from the original on February 9, 2007. Retrieved 2007-09-15. ^ "Juice Plus Children's Research Foundation homepage". National Safety Associates. Archived from the original on 2000-04-09. Retrieved 2006-10-15. ^ "Juice Plus Children's Research Foundation". Guidestar.org. Archived from the original on 2015-01-01. Retrieved 2009-08-21. ^ Barrett, Stephen. "Questionable Research by the Juice Plus Children's Research Foundation". MLM Watch. Retrieved 2007-02-05. ^ Barrett, Stephen. "Questionable Organizations: An Overview". QuackWatch. Retrieved 2009-09-21.